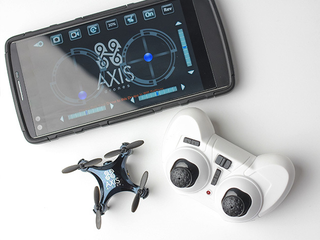 The Axis VIDIUS drone may only measure less than two inches across, but it can live-stream video back to your phone from 100 feet away, with gyroscopic stabilization for a steady, first-person view. You can order one now for $75 with free shipping, over 20% off MSRP. The VIDIUS is small enough to avoid FAA regulations, but this tiny quadcopter is able to fly stunning aerobatic maneuvers, indoors and out. This is thanks to the on-board gyroscopic stabilization, and you can choose from three levels of control sensitivity. Trick Mode lets you perform pre-programmed flips and rolls, and along with using the supplied controller, you can control the drone from your phone or tablet (iOS/Android). The accompanying app also lets you live-stream from the VIDIUS’ camera, which is able to record video and still photos. It even has LED lights for flying after dark. The VIDIUS can fly for up to 7 minutes on a full 20-minute charge, and it comes with a spare set of blades. The current deal on this pocket-sized drone takes 21% off the MSRP, with free shipping to anywhere in the Continental US. Interested? Check out the link below.